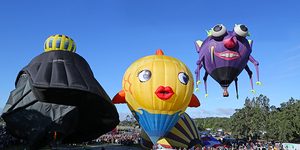 The Sonoma County Hot Air Balloon Classic is a yearly 2-day event where you can experience balloons up close, watch them launch, and even take tethered rides. The event is volunteer run and all profits support local charities. One of the most spectacular sights during the Hot Air Balloon Classic is the Dawn Patrol . These early risers begin their weekend mornings before daylight to launch at 5:00 AM. Dedicated balloon pilots use heat to fill their balloons during the dark morning, making for a breathtaking sight. For those who consider 5:00 AM too early and have not yet risen, many more balloons lift off during the Main Launch at 6:30 AM. While the balloons fly overhead, the park will be host to food, music, and crafts vendors who turn out to serve spectators and enjoy the festivities, which run until ~10:00 AM. 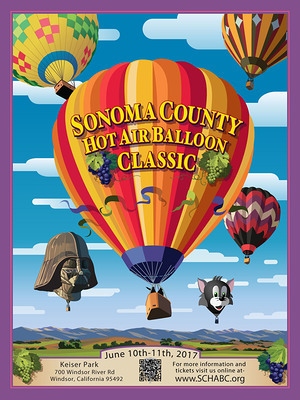 The Sonoma County Hot Air Balloon Classic (SCHABC) is a non-profit organization dedicated to building awareness in and promoting the sport of hot air ballooning, in addition to helping raise money for local charitable organizations. Take the exit to WINDSOR. Go 0.2 miles. Turn SLIGHT LEFT onto OLD REDWOOD HWY. Go 0.2 miles. Stay straight to go onto WINDSOR RIVER RD. Go 0.6 miles. Turn RIGHT onto WINDSOR RD. Go 1.1 miles. The Windsor High School Boosters’ parking is available on the left at 8695 Windsor Road. Take the exit to WINDSOR. Go 0.1 miles. Turn RIGHT onto OLD REDWOOD HWY. Go 0.1 miles.